There is probably no one more passionate and engaged in Canadian federal policy analysis than Brian Lee Crowley. He is an author, and the Managing Director of Canada’s #1 think tank, the McDonald Laurier Institute. In fact, the MLI has just received the 2018 Prospect Magazine Think Tank Award for Best North America Social Think Tank. Want to hear about Immigration Reform? Canada – US relations? Our national debt? Foreign Affairs? If it’s a national Canadian issue, you can bet Brian Lee Crowley has researched the topic at length! 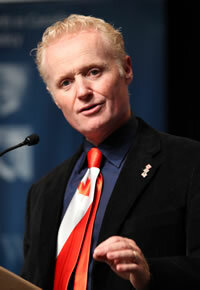 Whether you are looking for a powerful speaker to energize your audience, a stimulating and thoughtful public intellectual to engage your board in a private discussion about global and national issues, or a tough but constructive moderator to lead your group through a challenging direction-setting discussion, Brian Crowley will get the job done – and make you look good while doing it. Brian Lee Crowley is Managing Director of the Macdonald-Laurier Institute. MLI is the only think tank in Ottawa dealing with the full spectrum of issues falling under the jurisdiction of the federal government and was recently (2013) ranked as one of the Top Three New Think Tanks in the World by the University of Pennsylvania. As a result of his work at MLI, Crowley is regularly ranked one of the 100 Most Influential People in Ottawa by The Hill Times. In addition he is a best-selling and international award-winning author, frequent commentator across all media, and a widely-read columnist in the Globe and Mail, the Ottawa Citizen, the Calgary Herald and the Vancouver Sun, while his op-eds appear in newspaper and magazines in Canada, the US and internationally. The Economy ( Canada, the USA, Global ). Why Health Care is Broken and How to Fix It. Canadians love to think that this country has “the best health care system in the world”, even though that is quite obviously not the case by any objective measure. But it isn’t really a statement about facts, explains Brian Lee Crowley, Managing Director of the Macdonald-Laurier Institute. It is a “statement about morals, beliefs and good intentions”, he says. In this hard hitting talk, Brian Lee Crowley pulls no punches in telling your audience what 3 drivers will reshape our health care system for the better in the 21st century.